Ana Maria Fernandez, a beloved member of the Fellowship of Friends, completed her task from complications of diabetes causing organ failure on Saturday, December 12, 2015 at 1:05 pm, Mexico City time. 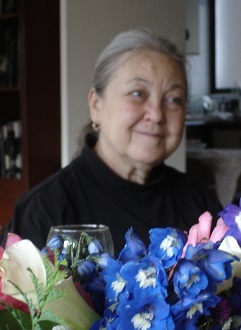 Ana Maria turned seventy on December 6, 2015. Ana Maria joined the School, in Mexico City, on August 15, 1988. She helped to open the center in Monterrey, Mexico, where she was a consistent and loving support to newer students. Ana Maria also gave of her time and energy to the centers in San Salvador and Cuba. Death is our friend precisely because it brings us into absolute and passionate presence with all that is here, that is natural, that is love. Death stands before eternity and says YES. Once she told me that before going to sleep, she used to take her little rosary with 10 beads and do a sequence. I told her: “Oh, I don’t have a rosary”. She looked at me in her sweet way and answered: “But you have fingers!” It was our sweetest moment together. amiguita, siempre estarás en mi corazón y en mis recuerdos. Hasta siempre. Beloved Anita, you were like a clear mirror through which I could see myself: sometimes in light, sometimes in darkness. Your words are still reminding me that our school is alive, and that I shall “act”my role with confidence. Your love is still keeping warm the Teaching House and enlightening our hearts. We thank thee: true friend. Mi querida Anita gracias por tu mirada llena de luz, tu gran ser y tu amor incondicional hacia todos los estudiantes que tuvimos el placer de compartir este camino contigo, siempre estarás en nuestros corazones. Anita el solo pensar en ti me llena completamente de un sentimiento de amor. Amor verdadero. Me enseñaste en tan corto tiempo lo esencial, lo que es tan sencillo que no se puede explicar. Ahora gracias a ti sé que estoy en el camino correcto. Sé que todo es aprender, pagar y ser. Me gusta oír en mi mente con tu voz -!Hazlo con intencionalidad! Sí que funciona. Gracias por coincidir conmigo y ser mi amiga. Anita, just thinking about you fills me completely with a feeling of love. True love. You taught me in such a short time the essential, which is so simple that is not possible to explain. Now, thanks to you I know I am in the right way. I know that everything is to learn, to pay and to be. I like to hear your voice in my mind saying: do everything with intentionality! It really works. Thank you for sharing and being my friend. Creí que te iba a extrañar, que se iba a notar tu ausencia por esa forma que tenías de arroparnos en tus brazos con tanto amor en cada llegada, pero no fue así… ni un solo día Anita, se ha notado que no estas, porque siempre estas, siempre me recibes igual y ahora me acompañas hasta mi casa. Te sigo amando como el primer momento y tu promesa de no dejarnos se ha cumplido. Gracias por esa forma de enseñarnos día a día tu presencia. No le digo adiós a quien aquí esta y por pedir sigue siendo Luz que ilumina mi camino. I will miss you, I thought. And that I was going to notice your absence for that way that you had of embracing us in your arms with so much love in each of our arrivals. But it was not like that, not even one day Anita, we have not noticed that you are not there because you are always there. You always receive me in the same manner and now you even accompany me to my house. I still love you like the first moment and the promise that you made of not leaving us became true. I am grateful for the way you taught us, day to day with your presence. I cannot say goodbye to whom is still here and continues being a light that illuminates my way. Sans Wine, sans Song, sans Singer and–sans End!